Over the past year, the University of Toronto has been working on a Mandatory Leave policy that would allow them to ‘suspend’ students experiencing mental illness. Late this week, that policy was finalized. Mandatory leave policies like this set us back decades on naturalizing disability on campus and efforts to destigmatize accommodation services. Students are just starting to ask for the help they need but now may be too afraid to self identify for fear of forced leave. Disability is already horrendously under represented at the university level and this policy may well drive disability further underground. That’s a real problem when seen in the context of unemployment among DPs, a number driven in part by a lack of access to education. Tech reviews can be a bit dime-a-dozen online, with everyone and their mother writing blogs, recording vlogs, making podcasts and sending up smoke signals about their experiences with all the latest gadgets. Despite this copious swamp of opinions, there remains a relative dearth of tech reviews focused specifically on experiences of accessibility and adaptability (outside, of course, some of the wonderful work done by the AbleGamers Foundation). Late last year, Microsoft Canada contacted me to see if I would be interested in partnering with them to fill this gap, testing out some of their devices and software to provide (public, and private) feedback on my experiences. What follows are some thoughts on tech accessibility generated after spending a some time doing a head-to-head comparison of (relatively) new Microsoft Surface Pro and Surface Book! Editors Note: this content was generated as a result of my partnership with Microsoft and should be viewed as such. Having said that, Microsoft has promised I would be able to provide my unfiltered opinions, good or bad, without fear of @MajorNelson annihilating me on Fortnite Battle Royale as retribution. From a young age, we are taught that the road is a dangerous place, whether you’re walking, biking or driving. We’re taught to always be vigilant, to use the sidewalks when possible and to only cross the road when it’s safe to do so. But the road can be exponentially more dangerous for wheelchair users, who tend to sit below the sight lines of drivers, often operate at atypical speeds, and at times have difficulty accessing the relative safety of the sidewalk and are forced to use the road instead. Of course, drivers should always be aware and share the road with other modes of conveyance (#BikeRights!!! ), but that doesn’t always work out. Recently in London, we were given an example of just how dangerous the road can be for wheelchair users, when a woman’s chair was flipped over after being struck by a police vehicle in an incident described as a “momentary lack of attention”. Typically, there’s not just one cause of a collision, but rather a confluence of danger factors that result in an accident. While I’m not privy to the details of the specific example in London, and cannot say for certain that any of these issues played a role in what happened, there is perhaps more to this story than at first blush, because there are two municipal and provincial legislative directives that contribute to the risk of roadway use by wheelchair users. 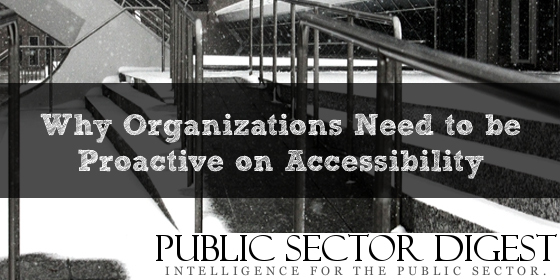 To put it bluntly, it’s extremely difficult to navigate the city in the winter as a wheelchair user. At times, our sidewalks are covered with so much snow they are rendered unpassable, but this is a reality in most Canadian cities. The bigger issue, though, is not the sidewalks themselves but when snow plows pass by and fill the curb cut in with a wall of snow, leaving the sidewalk (and bus stops) inaccessible. Similarly, a lack of snow removal at bus stops make an already problematic transit system even less functional for wheelchair users, as snow drifts can make it impossible to drop the ramp. At 15cm of snowfall, society crumbles and it’s everyone for themselves. This issue is, in part, a product of our bylaws. Currently, the city dispatches snow plows to the roads after 5cm of snow has fallen. However, the city does not dispatch sidewalk cleaning services until 8cm of snow has fallen, meaning if 7cm of snow falls they will clear the road but not send out a crew to clear the access to the curb cuts rendered inaccessible by the plowing. This may sound like a small gap, but it is not uncommon for sidewalk access to be blocked for days at a time in the winter. What’s more, bus stops can take up to 72 hours to clear in snowmageddon situations – stops that continue to be accessible to non-wheelchair users who can (albeit awkwardly) step over the drift. The result? Wheelchair users who cannot afford cabs or cannot get a ride on Paratransit (which is most of us…) are left to do it ourselves by driving on the clearest path available, which is the road. The more wheelchairs we have driving on the road, the more likely someone is to get hit as we sit below typical driver sight lines and are moving much slower than the standard flow of traffic. Simple solution #1 — ensure sidewalk entrances are cleared whenever the plows are dispatched, not just when sidewalks themselves are being cleared. One of the cited justifications for the accidental collision in London was that the wheelchair itself did not have any reflective tape and, therefore, the all-black wheelchair was difficult to see in the dark. While this is true, what is not explained is that this lack of visibility could be as a result of wheelchair funding programs in Ontario. The first program, the Assistive Devices Program (ADP), currently does not fund lighting packages for electric or manual wheelchairs because they’re deemed a “luxury” and not a necessary safety feature. To be fair, these lighting kits can be quite expensive (the set for my wheelchair was quoted at $1,000 for front and rear LED lights) and that requires a conversation about the medical industrial complex and the ways “medical devices” are up-priced to gouge insurance and government systems. At the same time, most aftermarket lighting options are independent of the wheelchair itself, such as the blinking red lights you can buy for bicycles, which can mean they are difficult to mount in a spot where the user can access it to turn it off and on and they rely on an additional power source to power them. The standard lighting package that could have come with my chair runs off the wheelchair’s existing power source and is accessed through the existing joystick, ensuring that users can access it when needed regardless of strength or flexibility. Because these kits are so expensive and they are not covered by ADP, most users forgo their addition and, as a result, are driving around without any lighting after dark. Me in my wheelchair, pictured at night. The second program, the Central Equipment Pool (CEP) which is a subset of ADP, has a rule mandating that all electric wheelchairs purchased through this program must be black, regardless of whether or not alternate colour options are available without increasing the overall cost of the chair. 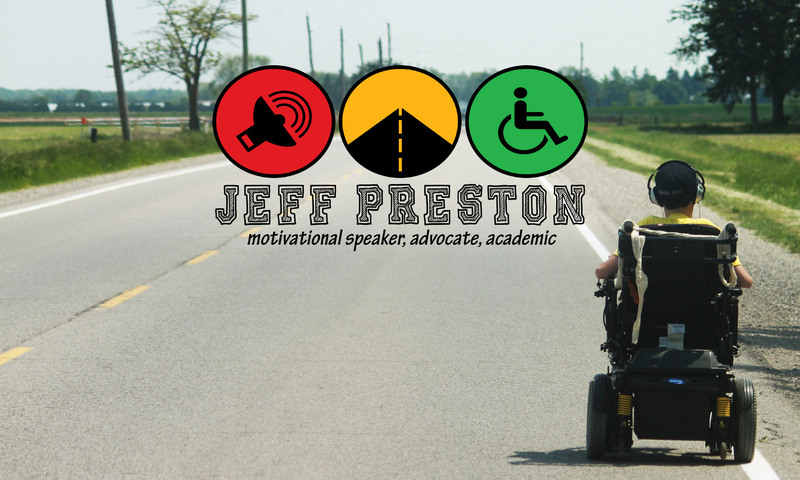 For example, my current chair, a Permobil F3, comes six different bright colours but instead of being able to get a chair that reflects my personality and taste, I was required to get the solid black model. It’s been explained to me that the principle behind this decision is that all CEP chairs are intended to be returned to the government when a user is “done” with it so it can be recycled and they don’t want an issue arising where a user receives a hot pink wheelchair they may not want to use. The problem is that this presumes two things about the CEP which might not actually be true in terms of wheelchairs. First, it presumes that CEP is actually recycling wheelchairs, which in my limited personal experience it is not, as I have never received a “used” wheelchair in my ~15 years on the program. Second, it presumes that wheelchairs are being returned to the program in a condition such that they could be sent out for someone else to use – my last chair went back to CEP without functional motors, batteries, or tires. From conversations with friends, this is not uncommon. It is so difficult going through the system to get approved for a new chair, and the client portion to purchase the chairs are so expensive, most people I know will keep their chair until it permanently and catastrophically stops working. But even if the chairs were being fully recycled, would it not be worth spending the (surprisingly little) money to buy the colour alteration kit when sending to a new user with the payoff being that people are not driving around in all-black chairs on the streets in winter without any lights because they’re deemed an “upgrade” and not a necessity? Simple solution #2 — fund lighting kits for wheelchairs and allow users to choose colours for their chairs that will increase visibility. This afternoon I was invited to deliver the keynote at the “Face-to-Face” wrap-up luncheon by an old friend, David Robbins-Singh. David and I met several years ago at Easter Seals Camp when he participating in a youth leadership program I was helping to run. 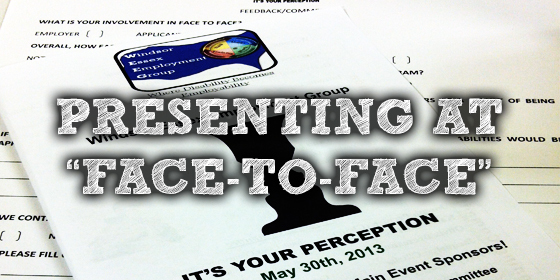 Face-To-Face is an annual program designed to develop employment opportunities for disabled residents of Windsor, Ontario and is an innovative effort to break down the linguistic and interpretive barriers preventing the integration of the disabled into mainstream society. There is no better way to break down the stigma around disability than by getting people with disabilities into the workplace to show the amazing things they can do when given the chance. I met some amazing people today and am really encouraged to see how many businesses in Windsor had jumped on board. Hopefully the participants found the program fulfilling and will have success in the near future retaining fulltime employment. Great day, all-in-all, and a very special thank you to David for inviting me! On Thursday and Friday of last week I was invited by Danielle Cheyne to speak to 3 sections of her Human Services class on accessibility and life with a disability. We had some excellent conversation and, as always, I was impressed by the students comprehension of the issues and willingness to learn. 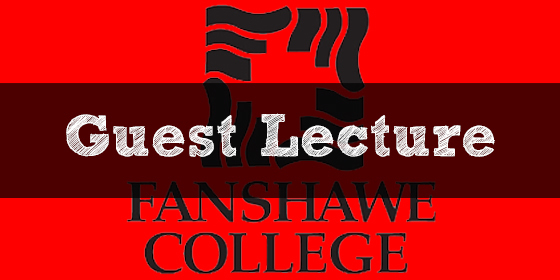 In a city that can be, at times, wholly UWO-focused, I think we need to remember to take time and recognize the great work being done at Fanshawe College. Thanks to Danielle and the students for being wonderful hosts, I had a great time and look forward to my next chance to spend some time on campus. From a very young age, video games have been an important part of my life. Growing up in a small town, I was one of the few disabled kids in the community, meaning I had few opportunities for accessible competitive team sports. Unlike my peers, I wouldn’t get the chance to learn valuable lessons of teamwork and sportsmanship on the ice or extreme patience on the baseball diamond. While I certainly found other ways to develop these skills, by Grade 7 my parents started driving me 2.5h to London to play electric wheelchair hockey, I still had always wondered what it would be like to take to the ice with friends, playing in front of a roaring crowd, and maybe score the game winning goal in a championship game. As it turns out, I have been able to have some these experiences, albeit simulated, through solo and co-operative video games (like the NHL series on Xbox and PS3) that allow me to transcend my physical limitations and compete with and against other people in a digital space. In the virtual world, physical ability just doesn’t matter as much. To help bring this technology to the masses, they are currently running an Indigogo campaign to raise the necessary funds. Got some spare coin? Why not hop over there and help give everyone the chance to play! This month’s edition of the Public Sector Digest features an article I wrote about the Accessibility for Ontarians with Disabilities Act (AODA) and why it is so important for both the public and private sector to embrace a culture of accessibility. You can check it out in the November print edition of the magazine or view it online with a membership here.